'Euphemisms are unpleasant truths wearing diplomatic cologne. '(Quentin Crisp). In his latest book, Nigel Rees, one of Britain's foremost commentators on English, has collected and explained 2467 examples of verbal perfume. 'Euphemisms are unpleasant truths wearing diplomatic cologne. '(Quentin Crisp). In his latest book, Nigel Rees, one of Britain's foremost commentators on English, has collected and explained 2467 examples of verbal perfume. 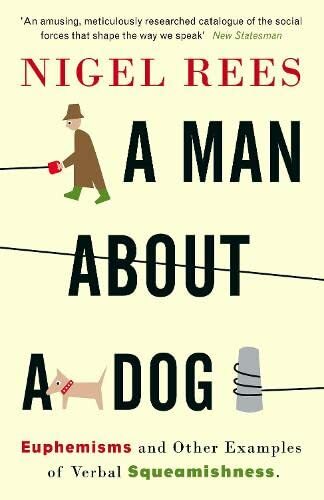 Fascinating, lively and endless fun, 'A Man About A Dog' is a must for anyone captivated by language and our ability to abuse it. Examples include: * 'Discussing Ugandan affairs' * 'Ambulance chaser' * 'Hygienically challenged' Nigel Rees is one of the best-known language writers and presenters in the UK. His 'Quote...Unquote' radio programme has been running for nearly thirty years.